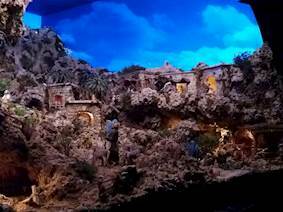 Two EH320UST ultra short throw projectors blended to create a seamless backdrop to the nativity scene. Based in San Gwann, Malta, Top Technix specialises in audio-video systems integration for both residential and commercial customers including like night clubs, bars, restaurants, offices, churches, education and government premises. Like most Roman Catholics around the world, Luqa Band Club located in the village of Luqa in the Southern Region of Malta, creates its own nativity scene. The nativity is probably one of the most recognisable symbols of the Christmas season, so the Club wanted to make its Yule tableau truly come to life. 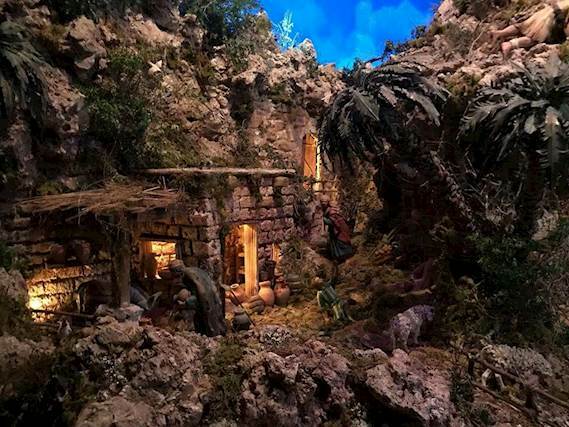 The 4m high by 4.5m wide and 4m deep nativity set was painstakingly handmade by local craftsman Sandro Farrugia. Toptechnix, in collaboration with Andrew Zammit - expert in edge blending, then installed and edge blended two Optoma Full HD ultra short throw projectors to create seamless imagery across three open walls and the ceiling. Projection mapped content was then added, together with lighting effects and sound, to bring the scene to life. Shepherds watch the clouds billowing and the sun as it makes its journey across a deep blue sky. This is then followed by stars skittering across the dark night before the sequence begins with a new day. With 4,000-lumens, the EH320UST is one of the brightest ultra-short throw projectors on the market. With Full HD resolution and an ultra-short throw lens, it can project a 100 inch image (diagonal) from just 55cm from the screen or wall. It has a range of input options, including two HDMI inputs and two VGA inputs, making switching between Blu-ray player, computer or other sources simply the push of a button. It also has networking capabilities that make it easy to manage remotely via RJ45. Compatible Crestron RoomView software can be used to power on/off, monitor, manage and control up to 250 projectors at the same time from any computer. An interactive version of this projector is also available that uses TouchBeam finger-touch interactive technology. HDMI connections were used Via a media server with multiple HD outputs with Edge Blending capabilities. The nativity scene was unveiled at Luqa Band Club one month before Christmas. 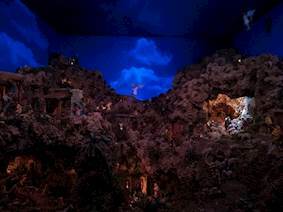 Sandro Farrugia, creator of the crib, also won best Crib of the year in Malta for two consecutive years.